Year is coming to an end. Lists are pouring in.. after lot of [lazy] tries of listing out my favorites - finally here I am with my favorite movies of the year. All the listed movies are released during the year 2010. Name and short take on why I liked it. Movies, that I enjoyed watching and worth mention besides the top 10 list. Last note, I have not seen yet, 3 movies that are favorites of many list makers : Phas Gaye Re Obama, Tere Bin Laden and Well Done Abba. It annoyed me from the very first promo of the movie that the 'hero' looked so average. Wondering 'what did Aditya Chopra see in him that was worth a three film contract'? The movie and his performance answered me for that. 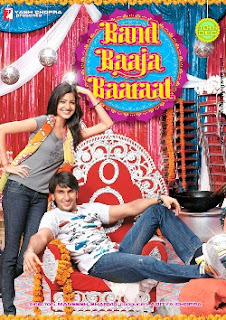 Ranveer Singh is the star of the show, well not only him, but Anushka Sharma shines as well. Again, a movie based in Delhi - Dilli. Showing true colors of the city. Unlike posh urban culture of 'Aisha', BBB has its heart set in the streets of middle class Delhi and get it absolutely right. More interestingly-it is shot 'on location' capturing true flavors, true colors of the city. Dialogue and screenplay are pretty sharp. Music is absolutely addictive [Salim Sulaiman]. There won't be a single person who did not want to dance when 'Baari Barsi' and 'Ainveyi Ainveyi'. Pace is apt. Acts are flawless. Ranveer shows sparks of talent in each frame. So is Anushka. She is a 'patakha'. As a bindaas girl aspiring to be a successful business woman, she's a treat to watch. Enjoyable moments between the lead pair. - what more one can want from a movie? Definitely one of my most favorite movies of the year. Don't miss it. See that line on top of the poster? If you can get that - you will love this film. Yes, its a trademark Farah Khan Film that never makes you think twice to laugh, think twice to involve in the movie. Just forget everything and enjoy whats on screen. The Farah Khan Thumb RUle that is. Last romcom of the year, and ah, its the best of the lot. Imran plus Deepika are perfect looking couple together. Lovely vibrant art direction. Great songs, especially lyrics. Fun first half, good second half, the movie is worth its two hours. Though I was confused about Deepika's character for behavior in second half. Confused about love life etc, but I stopped thinking there. After all, its a 'movie' right? Imran as a love obsessed puppy, is wonderful and in his character. Deepika looks gorgeous, and for the first time, I 'loved' his act. She's the Shahana Goswami was a surprise. And Lillette Dubey provided nice comic relief. and OMG Sharmila Tagore !!! Watch it, its a harmless little mushy movie. After the fantabulous soundtrack and rave reviews I was keen to watch this movie, but it disappointed me. I did not get 'that' much awestruck by the movie as people raving about it. I always admire such efforts on small scale, and its not that if you want to make a movie, it must be large lavish and has great stars. No. A movie can have totally unknown faces, still it can make impact. But somewhere, in the storyline, there was something that held it against my thoughts. Freedom in this movie is meant that the boy steals money from his papa's pocket, gets drunk at nights, fights with strangers, throws away papa's car - definitely I do not agree. Beautiful storyline the movie has - of a boy aspiring to be a writer. And some scenes are like a gem too where protagonist used to chant lines of poems. But rebellious scenes were too much, i think. Movie is seriously slow and eventless in parts, that nothing happens. Even, the fantastic songs are used in pieces. Wish they were used at full length. Performances were nice, the boy Rajat Barmecha is excellent. So is Ronit Roy as a tough father. 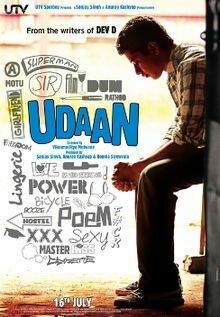 Overall, Udaan has its moments that are heart warming, but some flaws too. First of its kind - a movie in Bollywood is made in two parts. But I felt, that was unnecessary to differentiate a single storyline into two. The second installation of this bloody saga seems a bit stretched and overworked. This part has a 30 minutes recap of the first movie! So cut to two hours left - which are stretched just to make a full length movie. Second part has its own strength called Suriya. The man talks and acts with his eyes, pardon his southie Hindi. But sad that his act alone can not hold the hurried script and screenplay together. No doubt, there are moments that makes u 'awww..'. But after watching first part, many things are 'deja vu' and that makes it difficult for RC2 to hold on. Ramu should get Sandeep Chowta back, ASAP. Bappi Tutul are so loud. It was bearable in first part, but in here everywhere some useless pieces of background score are thrown. Remember the gripping 'silent like' score in Satya? That's missing. Instead annoying shlokas are chanted every now and then, is painful. Apart from Suriya, Priyamani is wonderful. Viveik looks tired of making same faces and Shatrughn Sinha is lost somewhere. Overall, this part was watchable just because of Suriya, and because we need to know what happened next, after watching the first part. Ramu + underworld + powerplay = awesomeness. Agree he has lost his mojo since many movies, but its back with this one. 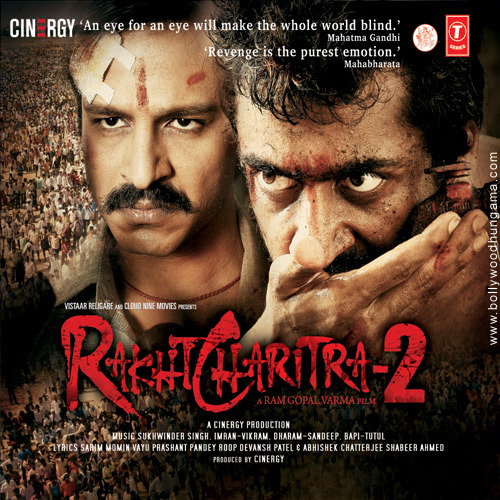 Shocking from its very first frame, gripping with each twist, Rakhtcharitra 1 is a must watch [but only if you can handle bloody gore visuals]. Viveik Oberoi is fantastic. He carrys the film on his shoulders, but wait, its Abhimanyu Singh who leaves his impression in viewers mind. As a baddie [would say, BAD bad baddie] Abhimanyu gives a stiff competition to Viveik. Shatrughn Sinha in a short role, is impressive - without moustache !! Inspired by true story, true incidents from the life of Paritala Ravi a south indian politician, Ramu has tried his best portray all the incidents 'as it happened'. Such a shock he gives us that these things 'actually' happened. And at the end of the movie, trailer of Rakhtcharitra 2 makes one hope even higher, with Suriya on the board. To be frank, I do not like Rajnikanth's movies from past, actually, all action films are a no-no for me. 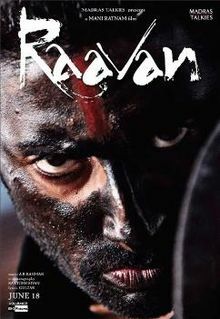 But this time with this sci-fi flick director Shankar made me realized what fun i was missing by avoiding Rajni's movies. Robot is full on masala entertainer, no doubt about that, Aish is looking beautiful [i m gradually liking her after she got married :P ] Though I found Rahman's music pretty average, in the movie, it did suit perfectly. Mindless action sequences, drama and comic moments - Robot does not have a single dull moment. Guilty pleasure - Kilimanjaro and Naina Mile. Fun picturization. Everything is just 'huge' in this movie. Not long-shots, there are huge long shots. [I sound crazy right? ], and that is a thing made me fall for this movie. As a kid, we all [in India btw] used to see the Batman series on Star Plus. I would never miss any episode of it. So definitely this was on my list of 'must see'. Sad that it wasn't released at IMAX. All who praised Heath Ledger's performance, I agree with them all. Indeed, he deserved it. Also, no doubt Nolan is a genius. 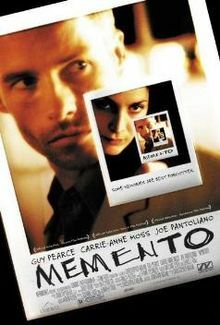 This is the only second film of him [after Memento] that I watched, now I am dying to watch the sequel of it. Another flick starring my fav newbies. Imran and Sonam, well, when I saw this, I already had enough torture by Sonam's 'non act' in Aisha. Well, i dont hate love stories - and also- its a movie about movies-so i have to love this movie as an unwritten rule, but don't know why I did not like this one. May be coz it had pretty long phase of two lovers not talking to each other - sad sad moments and stuff like that. OST is one of my favorites this year,but I did not like how each song is filmed as a part of movie shoot. Was expecting much more. I thought some more light moments could have been good for the movie. Duh! What a waste. I was so excited for this 'first one of its kind' movie of Bollywood. And as a fan of beautiful Sonam, and talented Abhay Deol - this was a major disappoint of the year. Each frame was perfect, but just like a pretty picture, that looks just pretty, does not 'act'. Sonam proved she has a daddy dearest who spends mucho money on her 'great' fashion sense. Wonder what Abhay was doin in this one? And oh, wonderful songs of Amit Trivedi - 'sigh''' wasted. My most favorite movie of this year. Acts, screenplay, art direction, songs, thrills - everything was perfect - as a movie should be. 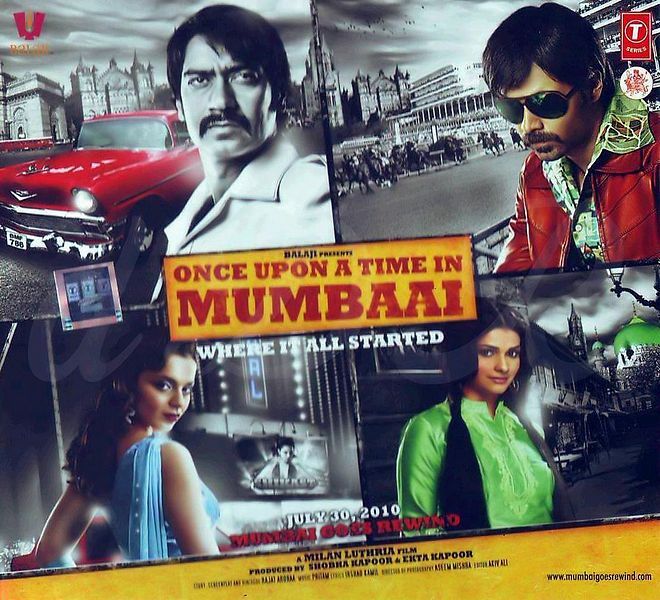 The era of Bombay of 70s is brilliantly created. Every small details has been taken care of. And the city of Bombay has been pictured in such a different way, that one would love to fall in love again. Also - its a movie about movies, well not exactly, but to some extent there is a background story of film industry. The references to the real life characters are clearly mentioned. That makes the story more intriguing for me. Ah, and that signature tune in backgroud of each scene !! 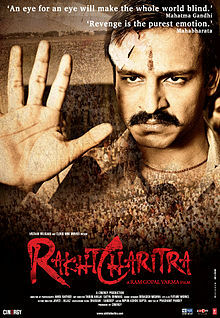 Underrated Emran is good as always, But its Ajay Devgan who leaves his mark with fantastic act like he did in Company. And the ladies ? Kangana and Prachi, both are lovely and 'acts'. Ah, and the lovely lovestory of Ajay+Kangna - perfect chemistry. Yet another wasted opportunity after movie Sikandar on similar background. There was a time when Kashmir and terrorism was hot favorite subject of many makers. 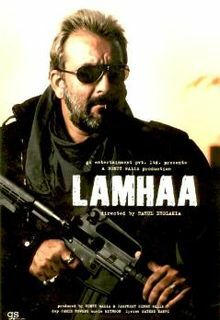 Lamhaa stands along with many such movies. But not as good as they were - Roja and Mission Kashmir for examples. Promos were fantastic and that made me watch it. But movie is a big downer. Starts of on a good note, but the typical cliches and mindless thrills and twists makes it a headache worthy. Music was real good, but it has been used only in bits and pieces. Bipasha and Kunal Kapoor are literally wasted. Sanjay is sleepwalking all around. Would not recommend this to watch at all - check out its nice soundtrack by Mithoon instead. Well, most anticipated movie of the year, and why not? Its from Manirathnam ! So huge expectations, and all went wrong in terms of public and critical reception. Breathtaking each frame - is the star of the movie. We have seen same locales in many movies, but the way it has been filmed here by Santosh Sivan-blows up mind. Pretty much criticized music sounds good in the movie too, especially Katta Katta. Underrated performance was of Ravi Kissen & Priyamani. Sad she did not have much screenspace. Adaption of Ramayana was brilliant, liked it more than the adaption of Mahabharata in Rajneeti, and oh the twisted end shocked me ! Forgot to tell how promising Vikram looked? Cheers for more vikram in Hindi movies. No matter with RayBans or without them. A typical masala mess by YRF. A mish mash rehashed version of Bunty aur Babli, that fails on typical formulas in second half. 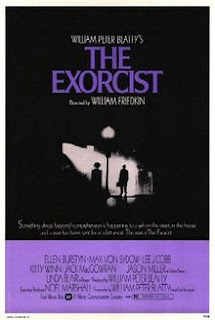 If its a con-movie, the cons has to be intersting, and it is insteresting actually, in first half. But by time movie enters in second half, the cons get repeated, that fails the screenplay there. Anushka tries hard to look hot, but she isn't that material yaar. Shahid is okay. Vir Das and Meiyang chang were good in start, but later they are sidelined to focus on [yawn] love story of Shahid+Anushka. I was crying for fresh air, when most typical twist in the tale happens - anushka gets pregs. Things go very predictably then, and the 'haappilly ever after' end is thrown. Bad use of lush production resources. After Aisha and IHLS, another mushy flick around with some great songs. Must watch it- i thought and went in to come out happy. Yes, in terms of entertainment, Anjana Anjani does not fall short. Storyline is pretty shallow though, its the treatment and the music which holds up the movie together. PC looks omg gorgeous and Ranbir does not skip chance to show his booty in this one too. Add vibrant picturisation of songs the movie makes a perfect candy floss entertainer. What I liked most was the funny sequences all around in the movie. Though it dealt with a serious subject of suicides, never it felt heavy. And I am not the one who complaints of back to back songs in a movie, So for me - it was worth to go for ! Oh dear Wall-E !! You make me cry everytime I watch you. Making my belief in the green world more stronger, making me do something to contribute to it. Making me salute to the studio de Pixar for producing such a heartfelt tale that tells its points almost without much dialogues. Voice of Wall-E - Ben Burtt with his 'too less things to say' - says much more. And the lovely chemistry of EVE and WallE is adorable. My favorite moment - when both of them dance in the space ! Keep 'em coming Pixar ! You guys put your lives into such creations- hats off ! Such a boring Trilogy ! Most overrated movies I have ever seen. No scares at all, even our Ramu can make better films yaar. Duh! waste of bandwidth, waste of 6 hours. Yawn. Don't know why, but despite of being a fan of this genre - these trilogy just couldn't get my attention at all. I think the rip offs are way better than this. These movies were much more 'theoritical' than being 'practical' and scare people. Wonder why it has been listed on top charts?! Don't know why- back here in India, people are so ignorant about the animation movies, they always mark it down saying 'cartoons are for kids' ! Would like to throw DVD of this movie to them, and say - meet me after watching this. Surely they would change their mind. I love love love this movie. Love everything about it. The cute 'wilderness explorer' Russell, 'oh please oh please' dog 'Dug' and lead characters - Carl and his wife - i just loved them all. Making me annoyed why I missed watching this on a big screen. Everything is so colorful, one can't keep their eyes off. The house with balloons in steer clear blue sky - heaven. And the distant world of Paradise Falls !! A brilliant part of the movie was - how it shows life of Carl and Ellie in such a short time span, yet heart touching it is. Fantastic movie by Pixar, riding high on my All time Favs list. Damn ! Such a confusing movie. I had to re-re-re-rewind the scenes to get it what the movie is trying to say. 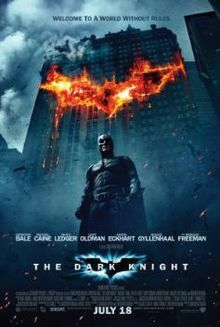 Ok, Christopher Nolan is God [!] but make it a little simple to understand what's going on screen, can you?? But give me Ghajini any day - Kalpana+Sanjay #ftw - make way Christopher ! Again, an old song has been taken and killed. Well, no doubt that Sonu Nigam sounds pretty honest in title track Yamla Pagla Deewana - a Dharmendra classic. But its the 'soniye manmoniye' addition sung by Nindy Kaur that put me off. Ofcourse, thats the thing one can expect when RDB is also included. If that is not enough there is a House mix too. Munni, Sheila and now 'Tinku'. Yes, that's the new one in Item songs race. Tinku Jiya is composed by the pioneer of such tracks Anu Malik. Expect outrage in terms of lyrics and composition-its there already. Shocked to see Javed Ali in credits alongwith Mamta Sharma. A track that will be fun at the time of release, but then, forgettable. Sandesh Shandilya's Sau Baar is a nice change from former desi tracks. Omar Nadeem and Shreya Ghoshal's duet sounds nice, but don't know why Omar is singing it like Atif? Another desi alert in Chamki Jawaani. Composed in fashion of 'Namak ishq ka'[Omkara]-Mamta Sharma, Daler Mehndi and Master Salim is another fun track that must be hilarious on screen. But so much of Mamta Sharma, is no no for me. Son Titariya is a folk piece sung by Krishna Beura, fast paced and foot tapping. Composed by Rahul Seth and Nouman Javaid, another riot. Talking of Punjab, and no Sukhvinder yet? Here he comes with Kadd Ke Botal - a song celebrating 'Punjabiyat'. An average one. And oh, Lyricist is Dharmendra !! The album concludes with Gubani by Shahid Mallya. Composed by Sanjoy Choudhary, ends pretty instantly. Should have been longer, nice one. Monty Sharma - the name largely missing from mainstream films even after giving a superb score in Saawariya, is finally in light with Mirch - a not so big movie directed by Vinay Shukla. As the subject deals with subject like sensuality - the soundtrack has all the tracks on the theme. Kunal Ganjawala with Vaishali Samant and Sharmishtha comes up next track - Zindgi tu hi bata. A typical Kunal croons, nothing to talk much about it. Interludes sounds like HumTum title song. Akruti Kakkar's 'Teekhi Teekhi Mirch'-western version is pretty average, even Javed saab's lyrics are not at all innovative. While Kalpana Patowary's Folk Version of the same reminds me of Ila Arun's 90s albums. Foot tapping it is just because of the rajasthani composition, but again, a forgettable one. Talking about Ila Arun, and she is next in the last track 'More Saiyyan'. With Pandit Girish Chattopadhyay and Chaaru Semwaal - a fusion designed in 'Enigma'ish way, Ila keeps chanting some lines, Chaaru too. And lead singer is Girish - a mish mash in name of 'fusion'. Wish there would be no silly western beats, this could have been a nice smooth track. Kaare Kaare Badra made me listen to this, and no doubt, it stands out in the album as the only 'worth it' track alongwith Mann Bhi hai. Based on a fantasy novella written by Neil Gaiman that has dashes of horror too, Coraline is one wonderful-beautiful little animation movie. Its a story about little girl named Coraline, who moves to new house where she find a small door that takes her to a new beautiful world, where all things that she dreams of-happens. But soon, she gets to realize its a trap of a witch. The movie is made with step motion 3D, graphics are excellent, taking us to lovely world of fantasy. Sharp screenplay holds up the attention, that when the movie reaches its dark part, it does scare the viewer even though its just an animation flick. How the little protagonist fights and saves her family is an excellent tale. 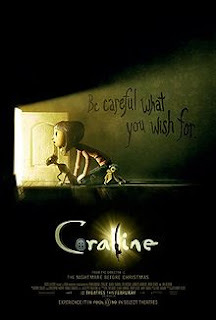 Though, some traces of Alice in Wonderland are there, like the secret door to another world, a cat friend etc., but Coraline has a unique storyline that makes a must watch. As it happens with every animated movie, I can never get tired of re-watching such wonderful fables. Who said there is only one - Pixar? Well, this one is from year 2009 - but I missed it then. Watched on DVD later, and man, what a movie ! Though, I would like to give full marks to the Director R Balki, then Mr Bachchan [well, yes, i m not fan of him, but still]. Why not Big B? Well, he has acted no doubt in such a heart felt way but I think all that make up [heavy!] and stuff were the main things that made us drool over his performance. And the direction, the moments - were more important then just the acts. By the way, I just did not like the political angle in this movie. Was not expecting such cliched scenes like exposing on public television and [annoying] Abhishek in many such scenes. But good part is- the humor. Loved the way subject is treated in such a light way. Oh, and Vidya Balan in saree !!! did I forgot to mention [over smart, but] cute kids? Wonderful songs by Ilaiyaraja, would love to hear more of you in Bollywood, sir. The year, is coming to an end. And I thought, why not put up my thoughts about the movies that I watched but couldn't write about. So, here comes a series of Mini reviews in some posts coming up. 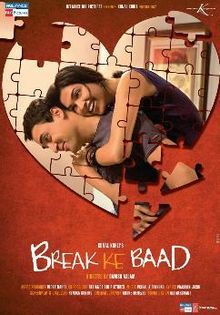 During the first quarter of the year, this Abhay Deol starrer impressed me. Dev Benegal made this small movie somewhat special with its interesting execution, story of an aimless guy roaming in unseen world. What I find interesting in the movie is, it has been shot in such a way that one just can't identify the places. And it was not intended too. From the Blue city of Jodhpur to white deserts of Kutch, such an eye pleasing each shot is. The best part in the movie was the 'Moving cinema hall' that was set up in age old truck. How all the characters get together and make the 'cinema hall' a super-hit amongst the villagers is an enjoyable part. Performances were definitely great. Abhay Deol repeats his past works, but nice. Dusky beauty Tanishtha Chatterjee was good but two supporting actors are my most favorite among all - Satish Kaushik and Mohammed Faisal [the Chaiwalla boy]. Overall, a nice refreshing change from regular formula films. 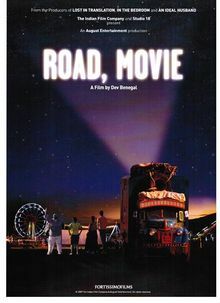 Tags : Abhay Deol, Dev Benegal, Road Movie review, Tanishtha Chatterjee, Mohammed Faisal, Satish Kaushik, Kutch white desert.